Why do I use Delkim? 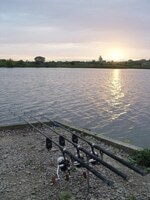 Many years ago I went carp fishing with a real master, Shaun Harrison. We fished somewhere ‘up north’ and what immediately struck me about Shaun’s fishing was the ‘finesse’ he applied to all aspects, rigs, hardware bait etc. On the indication front Shaun was using very lightweight homemade bobbins coupled with Delkim buzzers, this set up was giving him indications that I simply wasn’t getting on my super slick Stevie Neville swingers and Fox roller alarms. The indications Shaun was getting were enough to show him that fish were on his baits and after changing a few things rig wise he got the only bite of the day, anywhere on the lake. 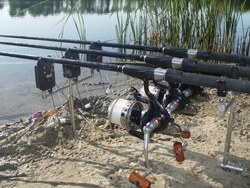 That was enough for me and I purchased my first set of Delkims before my next session. That session with Shaun coincided with a session on a local water in freaky weather conditions, driving rain then clear cold winter skies, my Fox roller buzzers actually froze and stopped me getting any bleeps at all, I woke to see the left hand rod tip pulled round violently, the fish was landed but this again showed the limitations of any roller buzzer. Since using Delkims I simply couldn’t imagine using anything else, the battery life is extraordinary and the range of sensitivity is huge. When I fish with braided reel line I turn them right down to 1 on the – setting because the braid has no stretch so the indication is magnified. I have used the Rx Plus Pro since it came out and am constantly amazed by the battery life, most of the time I fish the heads on zero volume with all the noise coming out of the remote that is either in my pocket or the back of my bivvy, that way there is no risk of spooking fish or alerting other anglers to your action! They say the sound of a Delkim is like marmite! You either love it or hate it! Well I love it, it’s the only buzzer that actually tells you how fast the run is going, most other buzzers make a single bleep sound like a full blooded run! I have used them at the tiniest day ticket pools in Essex and the massive 15,000 acre reservoirs in France and they have coped with everything I have thrown at them, I simply cant see myself ever using anything else, unless Delkim make a new one of course!